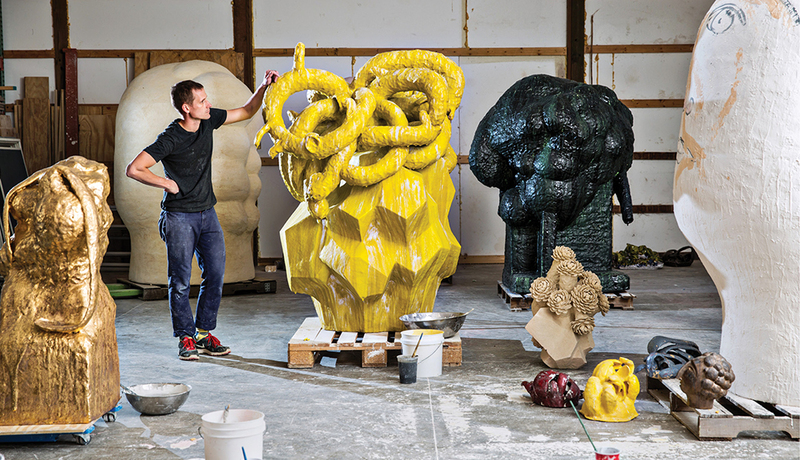 A farm in Athens, Ohio, may not be where you’d expect to find a young sculptor making a quick ascent in the international art scene. But you haven’t met Matt Wedel, nor seen his small botanical clay works or his massive, modern but adamantly sci-fi-esque creations. Yet. Google Matt Wedel and one of the first things that comes up is a five-minute Vimeo. In it, there is a moment that’s both graceful and startling. We see the Athens, Ohio-based sculptor—a rising figure in the international art scene—fluidly shaping what look like succulent leaves out of clay, one after another, affixing them to the head of a sculptural plant-like form. As he talks about his work, his hands seem to move with muscle memory, a creative force that is unconscious and alive, as if the hand of nature were working its way through his fingers. It’s like watching a thought, or a metaphor, take shape and become an object. Matt Wedel: Athens (2013) from L.A. Louver on Vimeo. 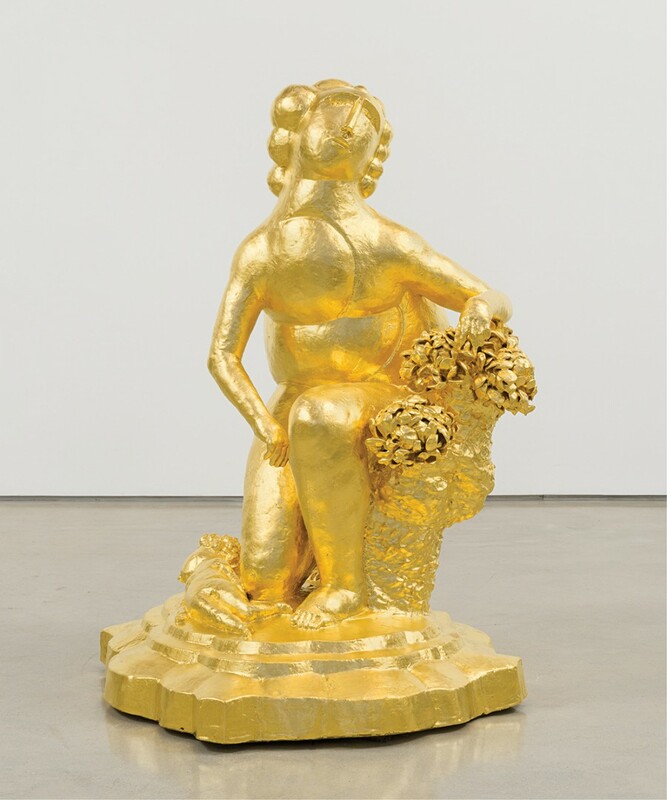 Wedel’s work has been called “squarely within the Modernist tradition” and like “science fiction” (Sculpture magazine); “heroic in scale and quantity while, at the same time, intimate” (Glasstire); and “magnificent” (Los Angeles Times). Of course, not all of it can be danced into existence by the movement of wrist and fingertip. 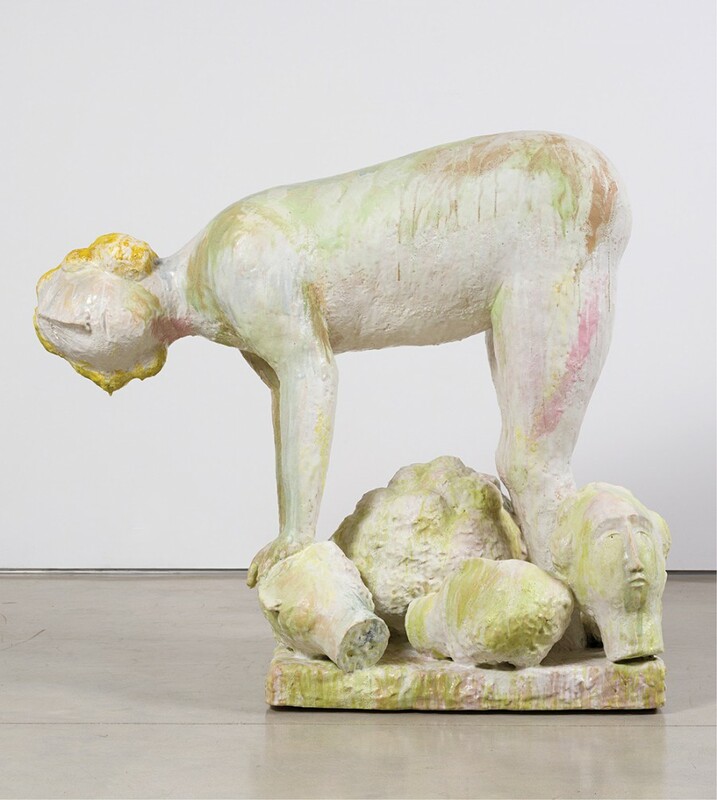 The young sculptor is best known for two diverse series—one of them botanical and geologic and smaller in scale, inspired by the landscape of southern California; the other monumental, with larger-than-life-sized mythical beasts and portrait studies, unsettling explorations into the meaning of innocence. 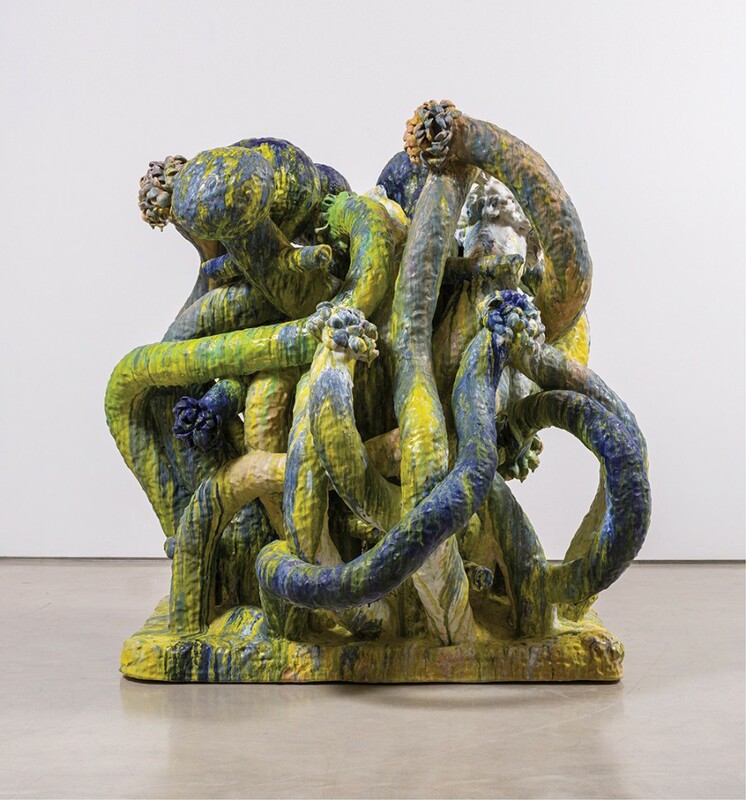 The large works are constructed of coils of clay that would require way more than two hands to lift. These are huge, smooth creatures, modeled after cherubs and lambs formed as one being—the kind of thing you might see in the pages of medieval illuminated manuscripts. They weigh as much as 3,800 pounds. Wedel is only 32 but is represented by the L.A. Louver Gallery of Venice Beach, which reps many big players, including David Hockney, the late Alice Neel, Mark di Suvero, R.B. Kitaj, Richard Deacon, and Deborah Butterfield. He has had exhibitions in Marfa, Texas, and Erskine, Hall, & Coe in London, Saint Mary’s University in Nova Scotia, and of course, Venice Beach, where his most recent solo show opened November 18. In the art world, he has officially become a person to watch. About five years ago, Wedel moved to Athens, bringing his own brand of restless energy and sensory intelligence to a studio where he’s been able to let his imagination take liberties with the local clay and feed off of the hyper-local food movement. It’s not the first place you expect to find a young artist of his caliber mining the earth for ideas. Keen to see what kind of landscape was forming around someone who is reshaping the way we think about clay and its power of expression, I headed out Ohio Route 32. Which is all just a way of saying that when it comes to conventional ideas of ceramics and sculpture, Matt Wedel is breaking the mold. On a rainy fall Wednesday, at the artist’s studio, I come across one of the unfinished pieces from his botanical series. It’s about two-and-a-half feet high and looks tiny amid the eight-foot-something clayworks that dominate the space. It sits there like it owns the place, unaware of its size, but Wedel says that’s because he hasn’t decided where to put it. Behind the artist stands a large sculpture—no, call it a figment; it’s Gorgon-like and seems to be frozen in mid-dance. It’s about eight feet tall, with a glaze of blackish-green, and tendrils like a plant whose DNA went into revolt. Made of coiled clay—very large coiled clay—that has been smoothed and shaped, it is indeed a wild thing. Appropriately, perhaps, it has no title. 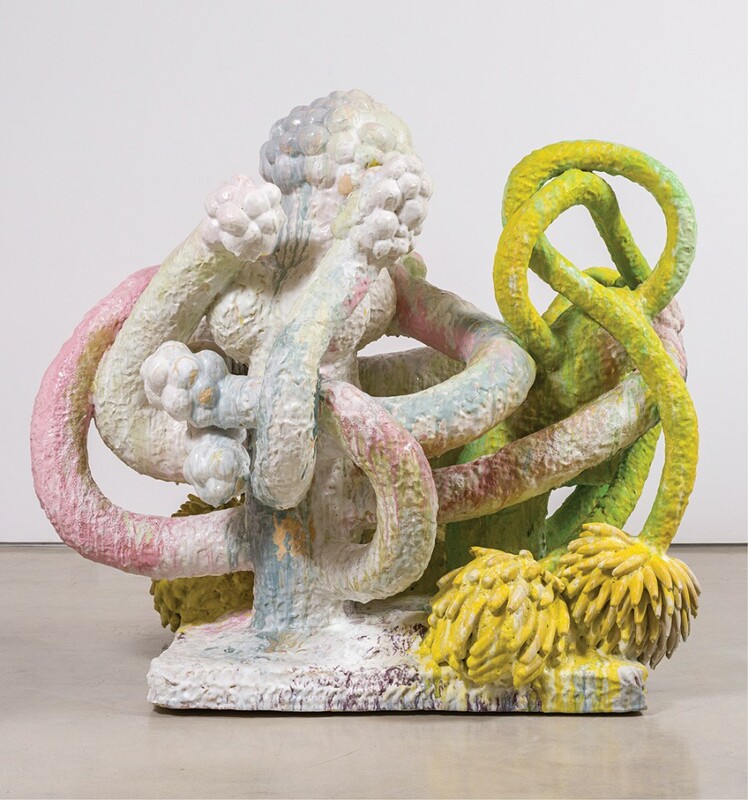 Near the Gorgon is another large piece, which looks like one of the sculptures in the botanical series taken to its logical next dimension—if wildness is your logic. The top of its arms could be pipes or spigots. The color is characteristic of Wedel, a dense application that is hungry for sunlight, like a black hole that happens to be yellow; it’s a voracious thing, dripping and asking for more, but it stops short of being grotesque. Its sense of movement is palpable, as is the strong suggestion of narrative. As he shows me around the studio and the farm, Wedel returns more than once to thoughts of narrative, of work that develops a theme. He has an almost sculptural way of speaking. Sometimes there are long pauses. His sentences take odd shapes, seeming to turn away from a line of thought, only to approach it from a different angle. Wedel and his wife, the clothing designer Coral Marie Wedel, moved to the southeastern Ohio countryside when they were expecting their first child. They had been living in California for about four years, followed by a stretch that saw him taking teaching gigs at Nova Scotia College of Art and Design, the Rhode Island School of Design, and the University of Colorado in Boulder. But they decided they wanted to be near Coral’s family—and near the midwife who helped deliver Coral herself. The midwife is now their neighbor, a few farms over, and she assisted at the birth of the Wedels’ first child, Abner, who is now 5. Their second, Eleanor, a lively and engaging 2-year-old, was born at a hospital. A couple of years ago, the family bought a nine-acre farm on a winding road in Albany, near Athens. There are vegetable gardens and terraces where asparagus and berries grow, which will be watered by a huge blue-glazed cistern Wedel recently made of clay; he’s in the process of making four more. A band of curious chickens poke around. Wedel says most of them came from a neighbor’s rogue hen, who hatched her chicks on one of their fields. They’re probably a mix of two fancy breeds—Silkies and Polish chickens—and Wedel complains that they get into his work space. Close to Wedel’s studio are butternut squash plants, their fruit growing large. Down the hill there’s a pond, with a canoe and fish, and a large tree house Wedel built for his children. Like any small farm, it’s a semi-built environment, a mix of vegetative growth and human intervention, a counterpart to the forces that are given free-play in his studio. When asked to name some of the artists who have influenced him, Wedel rattles off a list that ping-pongs across art history: the American ceramics artist Tony Marsh, the Norwegian sculptor Gustav Vigeland, the Colombian painter and sculptor Fernando Botero, the Italian Renaissance sculptor Luca della Robbia, the 20th century artist Niki de Saint Phalle, the Catalan architect Antoni Gaudí, and some of the unknown Italian and Spanish painters of maiolica platters. Later, after more consideration, he mentions a new kind of influence: the forward-thinking farmers and slow-food adherents he has come to know in the Athens area. In his most recent work, a viewer senses the two landscapes intermingling in the artist’s mind—California and its water-storing succulents and Ohio, where asparagus grows wild and the artist spends a fair amount of time farming. Flower Tree, a five-foot-high, purple-pink botanical riot, incorporates both succulent forms and stalk-shapes. Behind the couple’s midnight blue ranch-style house they have constructed a studio that houses five kilns, one of them big enough to fire components for the artist’s monumental clayworks, which can stretch to 10 feet tall and more. These Wedel handles without the help of assistants—no small feat as large-scale clay works can break, as well as be very heavy. It explains why the kiln room is equipped with a forklift and a gantry system that slides a movable platform horizontally into the kiln, which has movable walls. “Everything is pretty set up for me to do it myself,” Wedel says, noting that it’s only “labor intensive in terms of the time” it takes a large piece to fire. They can be fired over 12 hours, or even two days. In Wedel’s kiln room is a huge piece that looks like a mythic beast. It has been bisqued—that is, fired once to harden the clay—but not yet glazed. 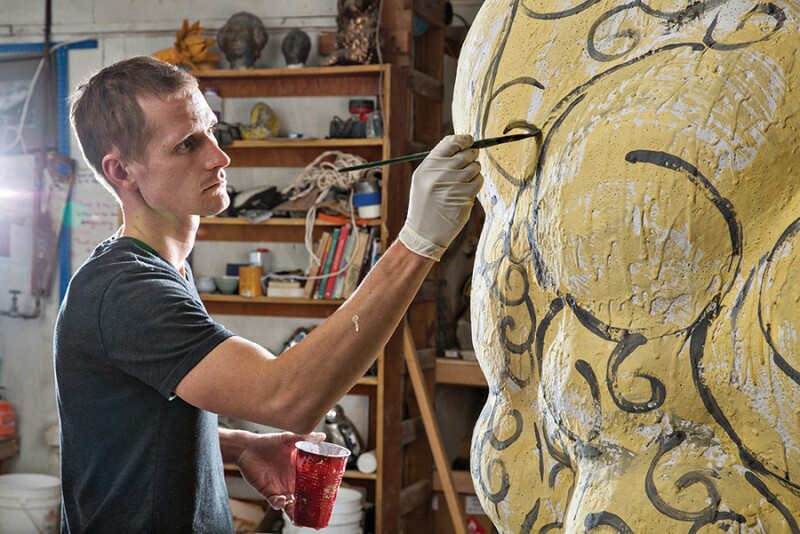 Wedel is currently working on two or three pieces for the Omi International Arts Center in Ghent, New York. This big white beast could become one of those thoughts expressed in physical form. On shelves around the studio spaces, there are a number of portrait-study heads, mythological creatures that are partly born from his imagination and partly inspired by a story from the New Testament—The Massacre of the Innocents. These heads are purposefully simple, almost naïve, like the children depicted in medieval and renaissance iterations of the Massacre. When I ask if he is religious, Wedel pauses before explaining that he finds beauty in the stories of the Bible, particularly as metaphor. He was raised for a time in what he calls a “New Age Christian church” in Colorado, and as a child he connected with Biblical mythology. But in his teens, he felt it didn’t add up—and this new feeling represented a real loss. Like so many artists, he feels his spirituality is in the making of his art. Wedel was born and raised in western Colorado, in the Grand Junction/Palisade area. The son of a nurse and the well-known potter Tim Wedel, he grew up around clay, sometimes helping his father in his studio. He enrolled at the School of the Art Institute of Chicago—where he met his future wife—intending to become a sculptor, thinking he would work in steel. But he had an affinity for clay, and it turned out, a love for the medium. Five years after making the area his home base, the artist is experimenting with local clay, some of it from a friend’s farm down the road. That’s the thing about a coincidence: We ascribe a kind of magic to such an occurrence, as if, somehow, it shouldn’t have happened. But a coincidence lasts only a short time. Once the collision has occurred, things start to grow together; soon enough, disparate entities are entwined. If you could stop time, those moments that follow a coincidence, they’d be sculptures.